At 26, Eugene DuClos admits he still has much to learn about his chosen field. But the Appalachian State University senior majoring in industrial design can’t help but be proud of his work and the recent accolades it has received. This year, he won first place in the university’s Chair Design Competition for his Tess seat. And he returned home after New York’s International Contemporary Furniture Fair in May, shocked by the number of outlets interested in purchasing his Wright Bench, which doubles as a bicycle rack. DuClos began drafting concepts for the bench during a junior year design studio sponsored by Eastman Chemical Company in Tennessee. Eastman provided students with its Perennial Wood, a product that rivals teak in durability and longevity, and tasked them to come up with innovative outdoor products. After many trials, DuClos presented a design that called for a metal frame and bike rack and set about taking his plan from paper to product. Influenced by an interest in aviation, he constructed the seat and back to resemble airplane wings using 76 slats of Perennial Wood. Out of 22 student projects, the bench was one of 12 chosen to show during the High Point Furniture Market in April and one of six to attend ICFF. In August, DuClos’ creation traveled to the International Woodworking Fair in Atlanta for the Design Emphasis competition. As he begins a busy final year, DuClos, who is minoring in marketing, has added one more task to his load—finding a manufacturer for the dual-purpose bench. He found his inspiration in the tesseract, a four-dimensional representation of a cube. Also known as a hypercube, DuClos believes it has the perfect components for a stellar seat. “The idea that a tesseract appears to change shape allowed me to do different iterations and play around with the shape and angles, and make something that not only was comfortable, but visually appealing,” he explains. For the final prototype, he spent nine hours wrapping nearly 1,000 yards of 30-pound fishing line around the chair’s half-inch metal frame to construct the arms, seat, and back. As happy as he is about his first pieces of furniture, school is just one step toward a larger goal. 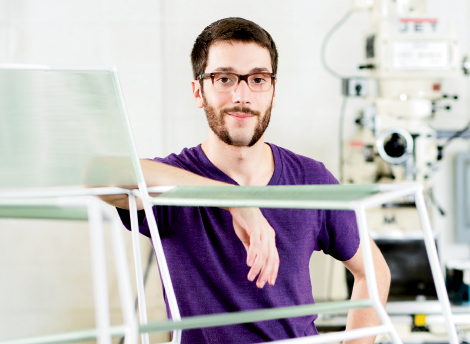 DuClos became interested in industrial design because of his passion for car design, and he hopes to pursue the field after graduation. He even got a jump start on the process last year when he drafted a sports car for a three-dimensional modeling class. Many students begin car designs for the course but opt to go with another project in realizing how difficult and time-consuming it is to complete a model of such magnitude. DuClos proudly notes he was the first student to complete a car for the class, but as he looks at the intricate model (which resembles the Ferrari 458) on his computer, he points out minor enhancements he would make.